There are many configuration options available. The board can play back multiple sound tracks, the inputs can be edge or level triggered, sample rates may be different for each track. We convert an original sound track from a .WAV file and load it to the memory chips. Up to 16Mbit of memory is available. Sample rates are 6, 8 or 11.025 KHz. 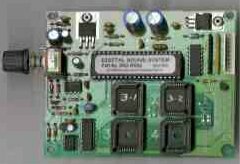 The board is powered from 12 volts unregulated DC, and incorporates a volume control and audio power amplifier on-board. Continuous promotional announcements, Royal Copenhagen Ice Cream.. Coin operated simulator amusement machines. Putt Putt mini golf ranges, sound effects for course features. Cadbury Chocolate Factory redemption game machines. Win'n'Grin Chocolate Factory redemption game machines. These boards are available with very short lead times - contact us with your requirements.